SANTA BARBARA, Calif., Oct. 5, 2018 /PRNewswire/ -- A brand that has always defied convention, UGG® (a division of Deckers Brands, NYSE: DECK) celebrates four decades with "UGG: 40 Years", a global campaign which launched on October 4th. From what started as a men's surf brand in 1978 and transcended into a fashion industry authority, UGG® continues to show what it means to live the California lifestyle by being bold, provocative and free-spirited. Adorned with boldly colored poppies, California's state flower, the campaign pays homage to that legacy and features current ambassadors, model Adwoa Aboah and designer Heron Preston, who have played a role in the brand's success this year. 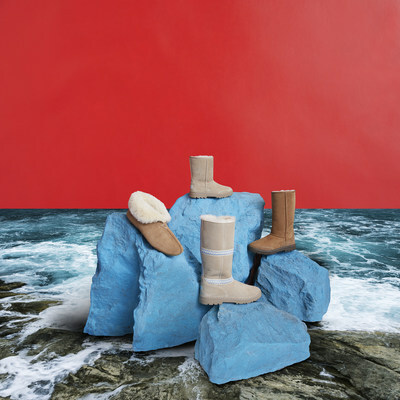 "From free-spirited surfers to provocative fashion designers and California creatives, UGG has embraced bold, unapologetic individuality for 40 years," said Andrea O'Donnell, President, Fashion Lifestyle Brands. "What the UGG brand stands for is more important than ever and this year we celebrate who we are now and look onward with excitement to the next 40 years." To celebrate this important milestone, the brand envisions a new future that's still deeply rooted in its past by teaming its most popular icons with icons in fashion, innovation, and art. These unique individuals represent the next generation of UGG®. Adwoa Aboah. With her bold personality, Adwoa Aboah rewrites the script of what it means to be a modern woman. A model and activist who has fronted campaigns for Chanel, Burberry, and Revlon. She challenges traditional standards of beauty, champions unconventionality, and builds a safe space for women to discuss mental health, sexuality, and body image without stigma and shame through Gurls Talk, a platform she founded with her best friend. Heron Preston. A genre-bending artist, creative director, content creator, designer, and DJ, Heron Preston carves his own path in the fashion industry through his commitment toward innovation, experimentation, and unpredictability. His unconventional style has led to collaborations with Virgil Abloh, Nike, Kanye West, and the NYC Department of Sanitation. His relationship with UGG® was teased during Coachella, when Preston put his spin on a limited run of UGG® Classic II Mini boots with the designer's signature pull tab and logo. The brand's full collaboration will launch in 2019. Additional cast members will be unveiled throughout the month of October. 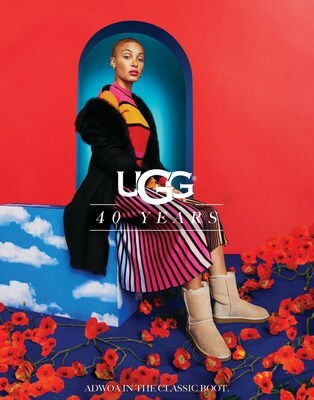 "UGG: 40 Years" was shot by photographer and visual artist Erik Madigan Heck, who is known for creating elaborate and surreal environments in his work. Heck brings a fine art sensibility to the campaign by reimagining iconic California landscapes, such as Big Sur and the Redwood Forest in saturated imaginative sets with vibrant colors and bold patterns, such as the sea of poppies, California's state flower. On October 4th, UGG® hosted an exclusive event to celebrate its 40th anniversary and global brand campaign at the iconic Hollywood hotel Chateau Marmont. Campaign stars Adwoa Aboah and Heron Preston were joined by Vanessa Hudgens, Teyana Taylor, Justine Skye, Luka Sabbat, H.E.R., SIMIHAZE, Hailey Clauson, Cozy Boys, Gianni Lee, Amanda Steele, Anne Winters, Neels Visser, and more to fete the momentous occasion. Celebrating the brand's past and future, the event featured musical performances by H.E.R., Cherry Glazerr and Heron Preston, and included art installations by Gianni Lee and Cleo Wade. After H.E.R. performed, she announced her role as the new UGG® brand ambassador and star in the brand's Autumn/Winter 2019 campaign. 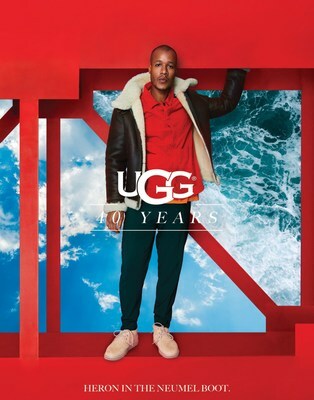 UGG® also ushers in their 40:40:40 Collection to commemorate the milestone. The limited-edition collection reissues its most beloved styles in the brand's original colorway, Sand. The capsule includes 40:40:40 branding in Women's, Men's and Kids' with prices ranging from $55-$180. The limited-edition collection is now available at UGG® stores worldwide, ugg.com and at the select global wholesale accounts while supplies last.